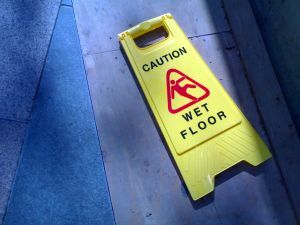 Slip-and-accidents can result in serious personal injury to plaintiffs. Zuppardi v. Wal-Mart Stores, Inc., an appeal heard by the United States Court of Appeals for the Seventh Circuit, involved a plaintiff who went to a big box retail store (“defendant”) along with her brother and son. Plaintiff took a shopping cart from the front of store and pushed it down a highly-trafficked walkway known in the industry as an “action alley.” Plaintiff was walking at normal speed and did not see any other customers around her when she slipped and fell in a puddle of what she believes to be water. She landed on a concrete floor. She believed the puddle of liquid was water, because it was colorless odorless. Plaintiff testified it was about two feet across and blended in with the floor very well. According to court records, there were no warning cones or danger signs or footprints or shopping cart tracks around the puddle, and she did not know how it got there. Her accident occurred in back of the store near a set of doors frequently used by employees. The doorway led to the time clock, overstock, security, management offices, and break room. While plaintiff was on the floor, she alerted an employee who was stocking shelves in the grocery area to assist her. Water for sale was shelved six aisles away from where plaintiff fell. Defendant’s assistant manager did not witness the fall, but testified any spill in that area would have been quickly cleaned up due to the number of employees who walk down the action alley to get to the back of the store. He said it would have been taken care of quickly, even if plaintiff had not fallen. He also testified all defendant employees were required to carry a towel and clean as they go while actively monitoring the store for spills and other hazards. Plaintiff filed a personal injury claim against defendant, and trial judge granted defendant’s motion for summary judgment, finding defendant had not created the fall hazard and did not have actual or constructive knowledge of the puddle prior to plaintiff’s injury. As our Boston fall lawyers can explain, in Massachusetts, the courts did away with any distinction between invitees and licensees in the 1970s and instead require a general duty of care to prevent injury to foreseeable plaintiffs. In Zuppardi, plaintiff appealed the dismissal. The federal appellate court held that trial court did not abuse its discretion when making its order. The court found that, under state law, business owners owe a duty to maintain the premises in a reasonably safe condition to avoid personal injury. In order for a business owner to be liable for a slip-and-fall injury, he or she must have either created the hazard through the negligence of its employees or had constructive or actual notice of it. With respect to the second basis for liability, the spill would have had to be on the ground for sufficient time that an employee should have known it was there and cleaned it up, if they were acting with proper care. That was not found to be the case here.